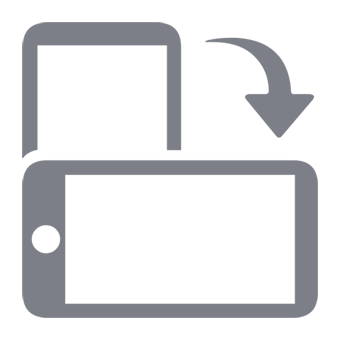 Microgaming are one of the top developers of online pokies, and Flo’s Diner is a classic example of the simple 3-reel games that they specialise in. It manages to look great, while retaining the ease of play and straightforward payouts that are the appeal of this type of game, but has a bit of a unique style, as all symbols are related to the theme, with none of the cherries or 7’s that can make similar titles all look the same, although there is just a single bar icon. Of course coming from Microgaming also means that fair play is assured, so it’s a game that can be trusted to deliver random results and pay out at a decent ratio. Flo’s Diner is a piece of retro Americana, set in a 1950’s style roadside restaurant of the type seen in numerous movies. Flo herself is the star of the show and like all of the symbols here, she’s in a cartoon style that really suits the theme. Those players familiar with 3-reel games will instantly recognise the layout of Flo’s Diner, although anyone new to them should easily pick up how to set a bet level and spin the reels and what rewards they will be in line for. 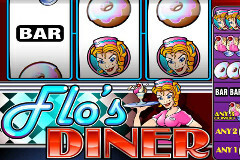 With just 3 reels and a single payline, Flo’s Diner is a very simple game that pays out prizes when the right combinations of symbols come to rest across the line that runs through the middle of them. One side of the game is taken up by the reels, with a ‘50’s style sign in neon below it, backed by a chequerboard pattern to give it an extra bit of style. Flo makes an appearance here as well, carrying an elaborate-looking ice cream sundae with her, although why she has a slightly crazed look on her face is anyone’s guess. The other side of the game is taken up by a payout table and it’s here that players will see what they will win. It’s split into 3 columns, each of which shows how many coins will be won if 1, 2 or 3 coins have been activated by the player, but as all wins are in the same proportions as the bet size, they won’t be missing out on any extras no matter how many coins are in play. To decide how many coins and how much to wager, there’s a control panel along the bottom which gives the option to set the value of a coin at 0.25, 0.50. 1.00, 2.00, 5.00, 10.00, 20.00 or 25.00, and then there’s the further option to choose how many coins to bet per spin for a total maximum of 75.00 per go. That’s a pretty good bet range, and certainly better than many similar games. The bottom rung of the payout table features a sugary donut symbol and getting a single example stopping on the line after a spin will see a prize of 2x the bet paid out. Then, if 2 of them land, it’s a payout of 5x. The bar turns up next, along with the ice cream, and any combination of them will also win 5x the bet, while a full line of the bar on its’ own pays out 10x. Line up the donut for a win equal to 20x the amount wagered per spin, and if it’s ice creams filling the line, then the result will be a win of 50x. Flo is the top paying symbol, and despite her menacing look, she’s quite friendly really, awarding 800x the bet amount when she lands across the payline. That’s substantially more than anything else, and this alone is sure to be enough to attract lots of players to the diner. Although the appeal of the theme is entirely down to personal taste, fans of 3-reel, single line games are sure to like Flo’s Diner. It’s a basic pokie, but has mostly original images and bright colours to the symbols. A good betting range is just one of the benefits of playing this pokie, but it’s not all perfect however, as there are no special features at all and it would perhaps have been nice to see a wild symbol, or even just a higher payout for getting the top symbol when playing with 3 coins.